This is a configurable grinding application for ID/OD grinders. It allows for up to 20 grind sequences, including a variety of dressing techniques. Grinding sequences include: Diameter Plunge, Diameter Reciprocate, Face Plunge, Face Reciprocate, Angular Plunge, Angular Reciprocate, and Circular Grind. 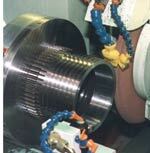 Face grinding can be done from the front or reverse face of the grinding wheel. Dressing techniques include: New Wheel dressing, Pre-sequence dressing, Interrupt dressing, and Multi-stock dressing. Dresses are available for diamond nib and roll dressers. Single operator window with optimized features for entering and restoring data. Specific pages for manual and automatic running of machine. Record of machine's performance saved to MDSI's Significant Events file. Customizable to change running of the grind sequence by using skip, continue, interrupt, hold, and end commands, again simplifying programming. Use of Visual Basic to present an intuitive interface.